Wind action moves mineral particles when they are in a dry state and unprotected by a vegetation cover. These conditions are found in deserts and semiarid regions of the world, as well as on sandy shorelines. Wind performs three kinds of erosion work abrasion, attrition and deflation. · In the process of wind abrasion, wind drives sand and dust particles against an exposed rock or soil surface. · When the wind borne material strike against each other, they are reduced in smaller particles. · The removal of loose particles from the ground is termed “deflation”. When rocks, consisting of alternate hard and soft layers are subjected to wind abrasion, differential erosion results. The soft layers are easily eroded but the hard layer’s resist erosion. Such formations are common in the Sahara Desert, and are also seen near Jodhpur. Mushroom rocks are formed in the desert regions by means of wind erosion. Wind-eroded basins are formed by wind deflation. Wind is an important agent of transportation in the arid region. The transported material is sometimes deposited in areas very far away from the place from where the dust particles have been picked. Winds blowing from Gobi Desert carry dust to the northern parts of China. In our country also winds blowing from Thar Desert bring dust particles to western Uttar Pradesh and the adjoining parts of Haryana & Punjab. This transported material is deposited in the fertile plains of Uttar Pradesh. Under certain conditions, the material transported by wind starts getting deposited at a particular site along its running track. When the amount of dust particles present in the air exceed its carrying capacity, a part of the material being transported is deposited. When the speed of the wind is reduced, its carrying capacity is also reduced. The material in suspension is thus deposited. When an obstruction comes in the path of the wind, air has to rise above this obstruction. They are of different types and have a variety of shapes. an obstruction in the path of the wind e.g. a bush, a stone or a dead animal. As long as the wind is strong enough to carry the sand, the sand dunes are mobile and they keep on shifting from one place to another. If vegetation or a line of trees starts growing on the dunes they become fixed. They also become stationary when they are blocked by a hillock. In case there is no such obstruction, sand dunes may bury agricultural land, plains and settlements. One common type of sand dune is an isolated heap of free sand called a barchan, or crescentic dune. They are found in large numbers in the Sahara Desert. These are long, narrow ridges of sand that lie parallel to the direction of the prevailing winds. The winds blow straight along the corridors between the lines of dunes, sweeping the corridors clear of the sand, However, eddies set up in the winds blow towards the sides of the corridors, depositing sand there to form these narrow elongated dunes. Seif dunes are common in the western part of the Thar Desert of India. The surface is covered by deposits of wind transported silt that has settled out from dust storms over many thousands of years. This material is known as loess. Loess tends to break away along vertical cliffs whenever it is exposed by the cutting of a stream or grading of a roadway. It is also very easily eroded by running water and is subject to rapid gullying when the vegetation cover that protects it is broken. 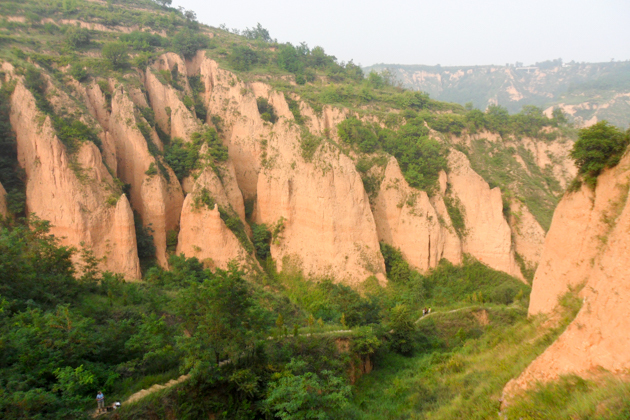 The thickest deposits of loess are in northeast china, where a layer over 30m deep is common and a maximum thickness of 100m has been measured. Besides China, deposits of loess occur in Mississippi Valley of North America and north of Central European Upland in Germany, Belgium and France. Loess deposits are found in Australia also. 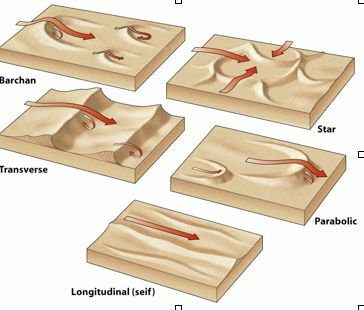 Depositional work of wind results in formation of topographical features like sand dunes, Barchan, seif dunes and loess.